In the movies, dogs usually get to be the good guys, while cats frequently represent more sinister forces. Here are five movies where cats almost steal the show or enhance certain diabolical aspects of human characters; all these films are available on standard DVD, Blu-ray, or other formats. The world of farm animals is brought to life courtesy of Jim Henson’s Creature Shop and CG trickery. However, every movie needs a villain, and Duchess, the spoiled cat, fits the bill nicely. Not only does she give the hero of the picture, an orphaned pig named Babe, a scratch across the nose (for which she’s promptly booted out of the house), but she later inflicts a deeper wound. Duchess reveals that pigs exist solely to be consumed by humans, shattering the pig’s idyllic view of how the world works. Subsequently, Babe fears for his life, flees the house, and nearly dies of exposure. Bad kitty! The only thing that snaps the pig from his physical illness and mental depression is an impromptu dance by the farm’s boss (played by James Cromwell in an Oscar-nominated performance). Francis Coppola’s The Godfather was one of those film productions where the events that were captured by the camera were almost eclipsed by what happened behind the scenes. The famous opening scene, for instance, has Vito Corleone (Marlon Brando), the patriarch of a criminal empire playing with a cat while listening to a man’s plea to murder some boys for revenge. The image of the Don holding a cat was also used for publicity. What people may not realize is Coppola found the animal on the Paramount lot and included the unscripted feline into the scene. It makes the opener more insightful and proves that appearances can be deceiving — a key theme in all Godfather films. The only thing more indestructible than James Bond seemed to be his nemesis Blofeld, as 007 battled the bald SPECTRE (SPecial Executive for Counter-intelligence, Terrorism, Revenge and Extortion) leader in six films. Blofeld seemingly met his demise when he was dropped down a smokestack in the pre-credit sequence of For Your Eyes Only, but not before killing Bond’s wife in On Her Majesty’s Secret Service. He also had a number of schemes to rule the world or wreak mass havoc, including making mankind sterile, starting a nuclear war between the U.S. and Russia, and detonating an atomic warhead in Miami. 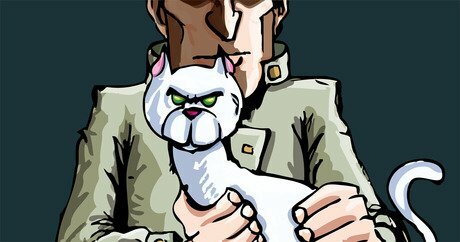 What adds to Blofeld’s sinister demeanor is a white Persian cat he’s usually stroking while orchestrating his foul plans, ordering assassinations, or executing minions who have failed to carry out his deeds (when henchwoman Helga Brandt is fed to a pool of piranha fish in You Only Live Twice, the cat watches, unfazed). Blofeld was lampooned to hilarious effect by Michael Myers as Dr. Evil in the Austin Powers movies (complete with hairless Sphynx cat named Mr. Bigglesworth). Right before the titular characters meet, Lady is faced with two Siamese cats that embody every horrible feline stereotype imaginable. When Lady’s owners take a vacation in the film’s narrative, Aunt Sarah temporarily moves in to look after their newborn baby boy. She also brings her twin Siamese cats, who proceed to shred the drapes, devour the goldfish, create a huge mess, and pin the blame on the hapless Cocker Spaniel. The cats also torment the viewer with “The Siamese Cat Song,” the lyrics of which will be stuck in one’s head for days: “We are Siamese, if you please…” The cats are only in one scene (and oddly absent for the Tramp-versus-rat finale), but they nearly steal the movie. Just because it’s animated doesn’t mean it’s for kids, and this film based on Richard Adams‘s celebrated novel is for older, more mature viewers. The circle of life depicted in this film is far more brutal than the one Elton John sang about in The Lion King. A tale of two rabbit tribes at war with each other, the weaker group tries to gain the upper hand by leading a farm dog to the “bad” rabbits’ den. As they attempt to bite through the dog’s leash, one of the rabbits is caught by a cat, who also lives on the farm. Pinning the rabbit to the ground, the feline outlines the nasty fate she has in store for the animal by brandishing razor-sharp claws and speaking in a deliberate, sinister tone about the suffering she’s about to dish out. Anyone have any movie cats they’d like to share?